Mumbai: Gold imports by India, the biggest buyer, slumped for the seventh month as jewellers and housewives shunned bullion because of record prices, a traders’ group said. Purchases so far this month totalled about 18 tonnes compared with 34 tonnes a year ago, said Suresh Hundia, president of the Bombay Bullion Association Ltd, citing preliminary data. Gold prices reached a record for a third time this week as a weaker dollar increased the metal’s appeal as an alternative investment and central banks from India and Sri Lanka purchased bullion as a hedge against the US currency. There may be 1.2 million marriages in India between now and 12 December, Hundia said. Demand in India is nil when it should have been at its peak because of marriages, he said by phone. December-delivery futures on the Multi Commodity Exchange of India climbed to a record Rs17,868 per 10g on Thursday and traded at Rs17,783. The price must drop to Rs16,000 to attract buyers, Hundia said. Global gold consumption was 34% lower in the third quarter compared with a year ago, when investors bought bullion as a haven from the economic crisis, the World Gold Council said 19 November. It was 10% higher at 800.3 tonnes in the July-to-September period as Chinese demand reached 120.2 tonnes. Demand in India advanced 26% to 137.6 tonnes in the quarter ended September compared with the previous three months, while jewellery consumption climbed 27% to 111.6 tonnes from the second quarter, the council said. Sales in the wedding season, which runs from September to January, may stay weak as buyers are yet to digest the 50% jump in prices in the past six months, Harmesh Arora, director of NIBR Bullion Pvt. Ltd and vice-president of the bullion association, said in a phone interview. Bullion has gained 34% this year as investors seek a hedge against inflation and a weakening dollar. The price may drop to $1,120 an ounce and a breach of that support level may see gold heading to $1,088, he said. A correction is round the corner and may start as early as next week, Hundia said. Gold for immediate delivery fell 0.7% to $1,183.15 an ounce. The metal, which moves inversely to the dollar, climbed as high as $1,195.13 after the dollar fell to a 15-month low. 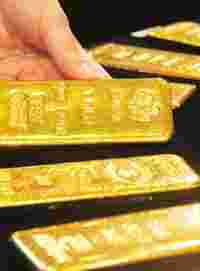 India’s central bank may add to its purchases of gold, the Financial Chronicle reported on Wednesday. The bank bought 200 tonnes for $6.7 billion from the International Monetary Fund.